This is the first game in the Rugrats series. For other games in the series see the Rugrats category. 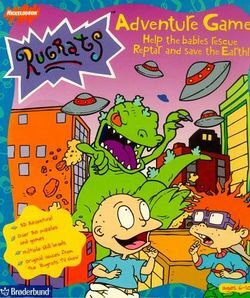 Rugrats Adventure Game is an adventure game, that was released by Brøderbund Software for the Microsoft Windows operating system in 1997. It is based upon the Nickelodeon animated series (or "Nicktoon") Rugrats, which was produced by Klasky-Csupo, Inc., who had previously produced the first three seasons for Twentieth Century Fox's The Simpsons, and another Nicktoon, Aaahh!!! Real Monsters. This game's box states that it features "original voices from the Rugrats TV series"; Tommy is voiced by E. G. Daily, while Chuckie is voiced by Christine Cavanaugh (1963–2014), who also voiced Oblina on Aaahh!! !, Phil and Lil are both voiced by Kath E. Soucie, and Angelica is voiced by Cheryl Chase, who also voiced several characters for another original Nickelodeon show, The Ren & Stimpy Show. This page was last edited on 31 August 2017, at 01:07.